Flannery Lane is tired of being protected by her Uncle Anatole, Wicker Street's most powerful wizard. After years of secretly studying magic in the back of his bookshop, Flannery longs to show the world what her own magic can do. Late one night, a vampire hunter knocks urgently on the bookshop door. The young man begs Flannery to fashion him a talisman to fell a vampire. Flannery looks deep into the stranger's gorgeous eyes and finds herself promising to help him. Little does she realize that this one act will lead to the adventure she longs for and a secret that turns everything she thought she knew about herself upside down. Flannery Lane, adopted neice of formerly-renowned wizard Anatole, is tired of being told not to practice magic. She's powerful - maybe even more so than her uncle - not no one on Wicker Street, or even in all of Threadneedle Alley, knows that she has any power whatsoever. The townspeople blame Uncle Anatole for everything that is going wrong, conveniently overlooking the fact that they've ignored his instructions, and Flannery has finally had enough. When Uncle Anatole is unable to help his first customer in months with a simple amulet, Flannery takes over despite her uncle's belief that magic will bring her harm. One night, a stranger comes to the bookstore looking for an amulet for protection against vampires. Flannery's interest is piqued - and not just because of the unusual nature of the vampires. The stranger is sweet and incredibly good-looking, even if she doesn't know his name. When it comes to light that vampires are in town wreaking havoc, Flannery steps up to take care of the problem. But will she make it out alive? I rather liked this book. It's a very quick read; I finished it in about an hour. 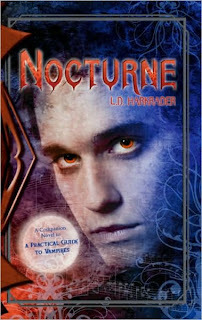 The cover is a little misleading, as the book's main character is a girl named Flannery, and she's not a vampire. The back cover blurb, however, is fairly accurate. Flannery is a likeable, if stubborn, character who only wants the best for her uncle, the only family she's ever known. She can't stand the way the townspeople walk all over him, then blame him when they can't be bothered to do anything they've been told to do and it all goes wrong. Over the course of the story, Flannery learns about her shadowy past and comes to terms with her heritage. I would recommend Nocturne to either middle schoolers looking for a clean paranormal read or high schoolers who want a nice, easy read or who read a level or two below their recommended grade level. L.D. Harkrader's previous novels include Airball: My Life in Briefs and Daisy Diaz Shakes Up Camp. Her next novel, Beanboy, will be released fall 2011.